Purchasing a stroller is a huge purchasing decision for a new parent. I vividly remember being confused when I made my way into a baby store a few months before my older daughter was born. They all had relatively interesting features so I picked one that I thought sounded good only to have its wheels break down a few months later. Since then I have tested out over 10 strollers, and have yet to find the perfect one. I&apos;m still on this mission and recently discovered something pretty close in the Stokke Xplory. Here&apos;s my experience strolling in the STOKKE Xplory. During the Momtrends Cabi Clothing party, I spoke with STOKKE about their Xplory and all of their features sounded exactly like what I needed. I was searching for something that would have an ease of use, the ability to add a kickboard and a stroller where my baby could sleep while we are on-the-go. 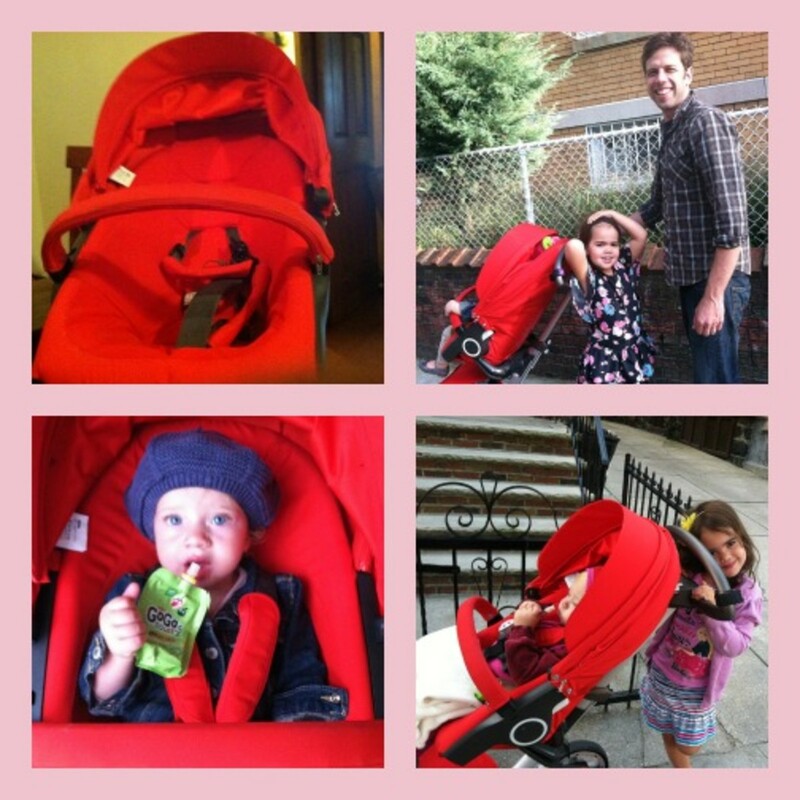 Since August, I have been testing out a bright red STOKKE Xplory in New York City as a way to get around with my baby and my older daughter thanks to the Stokke Xplory Sibling Board. I initially loved the height of the stroller where I don&apos;t have to bend down anymore and my baby can freely look out and check out the scenes around her. I can also adjust the height of the seat and the handle - depending on who is using it. What I did notice is that she rarely cries when I put her in the stroller and seems genuinely happy excited to go in the Xplory since she can look out and see the world in a higher position. I also personally love that the Xplory has a soft and comfortable padded seat and offers various positions to enjoy the sights or sleep. Since she is 16 months, I usually face her out, which can enjoy in a recline or an upright seated position. For smaller babies, the stroller goes into three positions that face parents - from sleep, to rest to active where a baby sits upright. For Stokke, this feature was important for them to offer parents so kids can &apos;explore the world&apos; and have the ease to go into various positions with a few simple clicks.To support the feet there is a sturdy footrest to combat dangling feet no matter how tall your child is. According to Stokke, "A footrest fastened at the correct height can help to aid the healthy development of bones, joints and muscles. And feet planted firmly on the footrest enable ease of movement of the upper body too, meaning your child can readily shift his or her seating position at will." Like everything else with the Xplory, this can be adapted or removed as your child grows. Since our stroller is like our car in NYC, we have been in the cold and rain with our Xplory (and I&apos;m sure snow as well). I loved the strong netted hood that is ventilated to assist with air quality, provide coverage from the sun and reduce moisture. Stokke describes this as a &apos;cocoon&apos; where babies and toddlers can "watch, listen, learn and play." 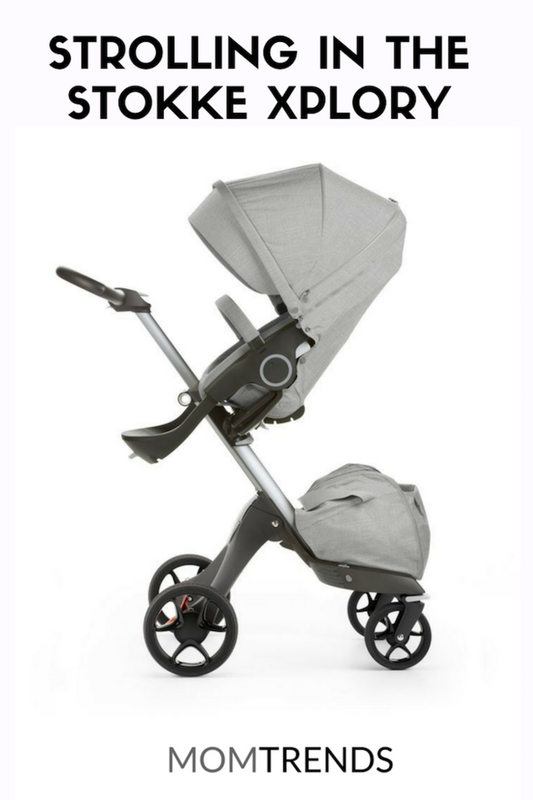 The Xplory also comes with a custom rain guard that easily fits over the stroller and can protect against everything from rough winds, bugs to harsh weather conditions. I also really liked how the visor could be folded back or removed by unzipping it. The stroller itself is also very smooth ride. I&apos;ve experienced strollers that couldn&apos;t live up to city streets, but the Xplory easily glides and swivels on uneven surfaces with no strain. When braking, I loved that it was simple to create a stop with both wheels via one action to ensure safety and ease of movement. The Xplory also a full-range of products for winter from a Sheepskin Lining to a Knitted Blanket to a Foot Muff to keep your baby warm and stylish this winter. The stroller also comes in various modern colors including light green, beige, purple, brown, black and dark navy that easily works for variety of tastes and style preferences. While these are my favorite parts of the Xplory, I do have a few critics. First of all the shopping bag is way too small. This is probably more of an NYC-specific critic, but we don&apos;t have a car so I use my stroller to store everything from groceries to my diaper bag. I personally found the bag to be too small and I had problems holding everything I needed while I was out and about with my baby. I also wished that the Xplory went to a full sleep position when she was facing out. Currently, the furthest back it goes is a rested position where I find it challenging for her to sleep in it since she is so engaged with the world around her. I do switch it over to her facing me for naps while we are out and about but it would be ideal to just have the seat recline a little more so I don&apos;t have to completely turn her around. I also find it challenging to take on the subway without elevators so I rarely travel beyond our neighborhood with it or take it on the bus. Another thing I noticed was that using the Stokke Xplory Sibling Boardthat I had to shift my body and push the stroller with my body towards the left or right. However, using the board has made it so much easier (tantrum-free!) to get around with both daughters - especially for our 20 minute walks to school that used to be a walking battle. Purchasing a new stroller is a huge choice and while there is not one perfect model, it crucial to do your research, test out models and get advice from friends. I love our new Xplory that I personally feel is a neighborhood stroller and not one that I can easily carry the subways or transport on the buses; however it does have many benefits and offers my baby a comfortable and engaging cocoon as well as the ability to see the world with no restrictions. For more of out favorites from Stokke, check out this review of the Tripp Trapp. The Stokke Xplory also meets all international safety standards and is avaiable at all national baby stores as well as online. 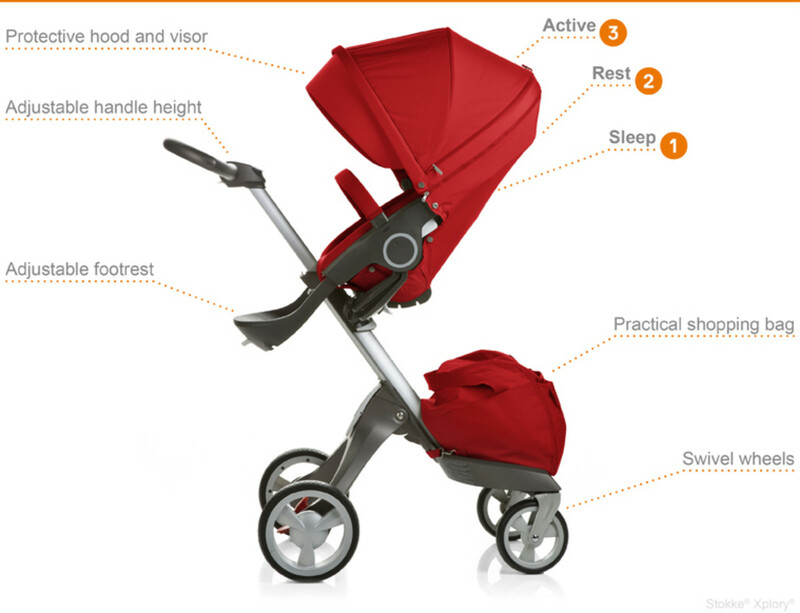 For more of our stroller picks, check out our Stroller recap here. Momtrends was not paid for this Strolling in the STOKKE Xplory post. We were given samples.